presents his old boss with a medal from the people of Mosul. the Iraqi presidency. This item suggests he is a tool of ISIS. "ISIS isn't the only player ... for the first time since 2003, numerous other factions and organizations are taking part and coordinating their actions to terminate the political process brought about by the American occupier. ... A reliable source in Mosul told a correspondent from Niqash that ISIS is bringing the Baath Party and other groups and tribes back into the spotlight in order to gain popular acceptance. Today, the citizens of Ninawa Province would welcome the Baath, or ISIS, or Ansar al-Sunna, or the Mujahideen Army, or any other factions whose names resonate in Mosul. This is a reaction to the erroneous policies of al-Maliki and the encroachment of the security apparatus into their daily lives for so many years." 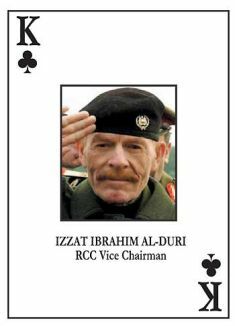 A U.S. playing card with the visage of former Iraq vice president Izzat Ibrahim al-Douri, vice chairman of Saddam Hussein's Revolutionary Command Council and the highest ranking member of the Saddam regime to remain at large. He has reportedly appeared in Mosul, the Baath Party's old stronghold, to claim the Iraqi presidency for himself and his party. Whether the Baath is making a comback or is just a tool of ISIS militants is unclear. After an 11 year absence imposed as a result of the American occupation, which banned the party under a new constitution, the Arab Socialist Ba'ath Party, which ruled over Iraq from 1968 to 2003, is making a comeback in Mosul. 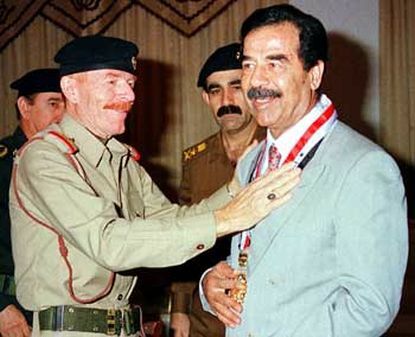 On Tuesday June 10, what many in Mosul are calling "Liberation Day," pictures of the late Iraqi President Saddam Hussein appeared in some areas, accompanied by rumors that former Vice President Izzat Ibrahim al-Douri had appeared at the Ninawa Provincial Headquarters near Mosul. Rumor had it that afterwards, he headed to the Mosque of the Prophet Yunus on the other side of the city. Yet unlike other recent events, not a single photo appeared on social or mass media platforms to confirm the news. That evening, masked gunman armed with Kalashnikovs asked people to attend a speech in the city square to be given by Al Duri on the occasion of the so-called victory of the people's revolution. Hundreds gathered, many with cameras and mobile phones at the ready, to capture a scene they haven't seen for over a decade. After an hour’s wait, an unknown man with a long beard appeared on stage and to everyone's astonishment, began a religious sermon. He then departed, leaving behind a disappointed audience who never even heard a mention of Al Duri's name. In the meantime, Facebook and Twitter, as well as SMS messages, advertised a televised speech by Izzat Al Duri to be given within hours to declare himself the legitimate president of Iraq, similar to the one he delivered a year ago during the Ahrar Square Intifada which broke out in the Sunni provinces, and which at the time, was broadcast by Al Arabiya. In that speech he appeared old, wearing thick glasses, and reading his lines with difficulty from a paper he held in his hands. He was in military uniform and heavily decorated with medals. Behind him stood four body guards also in military attire, faces and badges obscure [video in upper-right photo box]. Walid Mohammad Salam, a former Baathist, confirms that the raising of posters of Saddam as well as leaks about the presence of Al Duri in Mosul and his leadership of operations against Iraqi security forces are all attempts to revive memories of the party among its supporters in Mosul, a major base for the party for over four decades. During an interview with Niqash, Salam denied that Al Duri or any of the party's former leading figures are now present in Mosul. He said that elements of the Naqshbandi organization, a military wing of the Baath party, were the source of this information, as part of an attempt to seek and impose their influence and undermine the position of ISIS [the Islamic State in Iraq and Syria], which, with the support of other factions, had already fought [and won] the battle against [Iraqi] security forces. Responding to these claims is Rayan Ahmad - a pseudonym for another member of the Naqshbandi organization - who said that nine months ago, his party colleagues planned to carry out what he called “the revolution,” following the suppression by force of demonstrations and sit-ins by Iraqi security forces in Mosul and Huwayja. He said, however, for purely organizational reasons, that the "revolution" was delayed. He emphasized that ISIS isn't the only player, and that for the first time since 2003, numerous other factions and organizations are taking part and coordinating their actions to terminate the political process brought about by the American occupier. A reliable source in Mosul told a correspondent from Niqash that ISIS is bringing the Baath Party and other groups and tribes back into the spotlight in order to gain popular acceptance. 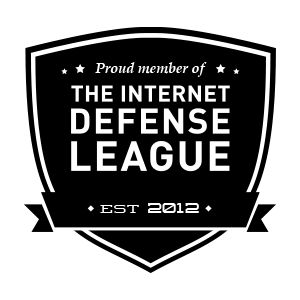 It is an approach that is part of the group's new policies for dealing with the civilian population. Later, however, having imposed its control over all of Ninawa Province, ISIS gave the Naqshbandi faction 24 hours to hide all pictures of Saddam, and called for a public meeting at the Al Haq Mosque, southwest of Mosul, which was attended by representatives of various [Sunni] factions. During the meeting it demanded that no flag or logo be raised other than its own black flag, and that no actions or decisions be made concerning the city or its administration without the direct permission of ISIS. As the supreme commander of Ninawa Province, ISIS made it clear that its rules will be enforced. "The citizens of Ninawa Province today see al-Maliki, as well as the entire political process, the same way they saw the regime of Saddam Hussein before it collapsed in April 2003. Today they would welcome the Baath, or ISIS, or Ansar al-Sunna, or the Mujahideen Army, or any other factions whose names resonate in Mosul. This is a reaction to the erroneous policies of al-Maliki and the encroachment of the security apparatus into their daily lives for so many years." Media affiliated with Shiite parties are also trying to highlight the role of the Baath Party in the events taking place in Mosul and Salaheddin, by greatly exaggerating its significance to create as many rifts as possible among groups that participated in the fight to take control of cities now outside federal control. The logic of the Maliki government is that since the Baath is a common enemy to all players on the Iraqi political scene, a Baath Party comeback would mean a 10-year reversion for the country.